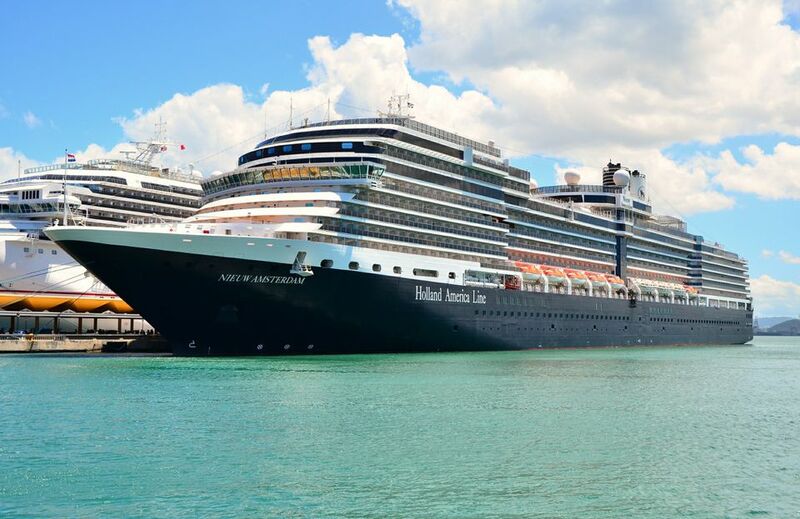 The ​Nieuw Amsterdam also has spa staterooms in the inside, oceanview, and deluxe verandah oceanview categories as well as spa suites in the deluxe verandah suite category. The spa accommodations have all the same features and amenities as the other staterooms or suites in the same category, plus spa amenities such as yoga mats, an iPod® docking station, and an in-room countertop water feature. The spa accommodations are located near the Greenhouse Spa and Salon where guests can easily book spa treatments or salon services and be near the fitness center. Inside cabins (without a window) are the least expensive and smallest of the Nieuw Amsterdam accommodations, with their size ranging from 141 to 284 square feet, depending on the location. Inside cabins are found on several decks and come in three types: spa, large, and standard. Although these cabins lack a window, they still have many of the same amenities found in other cabins. For example, inside cabins have two beds that can be converted to a queen-sized bed. They also have fine linens on the bedding, bathrobes to use during your cruise, magnifying make-up mirrors, hair dryers, and premium bath amenities from Elemis. Inside cabins also have a safe, ice service, flat panel TV and DVD player, and even fresh fruit on request. The nightly turn-down service and towel animals greet you each evening. The inside cabins have a shower, but not a bathtub. Oceanview cabins have a window and range in size from approximately 169 to 267 square feet. These cabins come in four types: ​spa, obstructed view, partially obstructed view, and full oceanview. Obstructed view means you have a lifeboat hanging outside your cabin window and blocking the view, but you still receive some daylight. The oceanview cabins have all the same amenities as the inside cabins and are found primarily on decks 1 and 4. Oceanview cabins have a bathtub/shower combination. The largest category of staterooms on the Nieuw Amsterdam is the deluxe verandah cabins, which are located on decks 4 through 11. Some of the deluxe verandah cabins are in the spa category. These cabins have a large floor-to-ceiling glass window and a private verandah (balcony) with two comfortable padded wicker chairs, a footstool, and a small table. They range in size from 213 to 379 square feet, including the verandah. In addition to the verandah, they also have a small sitting area. The rest of the stateroom amenities are the same as the oceanview cabins. The Superior Verandah Suites (categories SS, SY, and SZ) are on decks 5 through 7. Like all the standard cabins, they have two lower beds convertible to a queen-size bed. These suites range in size from 273 to 456 square feet, including the verandah. The amenities are the same as those found in the cabins, plus guests get a choice of pillows (firm, medium, and soft), no-host mini-bar, personalized cruise stationery, and oversized bath towels. The cabins also have fresh flowers, a one-touch telephone concierge service, and a complimentary DVD library. The Nieuw Amsterdam deluxe verandah suites are in categories SA, SB, SC, and SQ (Spa Suites). They range in size from 506 to 590 square feet, including the verandah. These suites have several extra amenities. For example, the two beds can be converted to a king-sized bed. In addition, the bath has a dual sink vanity, full-size whirlpool bath, shower, and additional shower stall. The sitting area is larger than that in the superior verandah suites, and there is a dressing room, a sofa bed that sleeps ​two people. One of the nicest perks of staying in a deluxe verandah suite or penthouse verandah suite is the exclusive use of the Neptune Lounge on deck 7. This lounge is accessible only with a suite keycard and is a great place to socialize with other suite guests, watch large-screen TV, read on the comfortable sofas, or enjoy the wide variety of snacks. The penthouse verandah suites (category PS) on deck 7 are about 1,357 square feet, including the verandah. These suites have all the amenities found in the superior verandah suites, including access to the Neptune Lounge. In addition, the size of this suite is as big as some houses. It has a bedroom with a king-sized bed, oversize whirlpool bath and shower, additional separate shower stall, living room, dining room, dressing room, private verandah with whirlpool, pantry, one sofa bed (sleeps two people), microwave, refrigerator, guest toilet, private stereo system, and floor-to-ceiling windows.